The peculiar label Zhelezobeton has now sent forth a new, fresh arm called “Muzyka Voln” in order to release different albums that may somehow feel different from its usual elements. Endless and unstoppable, Kshatriy, on the third album titled “From heart to heart”, is a shining example for such display of new sounds. Lasting for one hour from first track to the last, “From heart to heart” should be played continuously in order to completely understand the powers in balance on this recording. The sound carries, and I am taken into what I think describe to myself as ‘deep space’ only to later understand that this is not the case in here, not today. The whispering sounds and echoing, haunting rings of distant metal churches of acid are there to ensure my disorientation and sense of uncertainty in the dark, endless void I can se no way out of. On “Crystal Hand” I can hear vague voices that make me step off the path and wander, wonder, lost through the music. On the next track, “Rainbow Serpent”, there is a monolithic didgeridoo that provokes my senses with deep bass and deep meditations. I suddenly come to the realization that for almost ten minutes I have not moved one muscle of my body, as I wasn’t here, but there, in the void of this astral music. 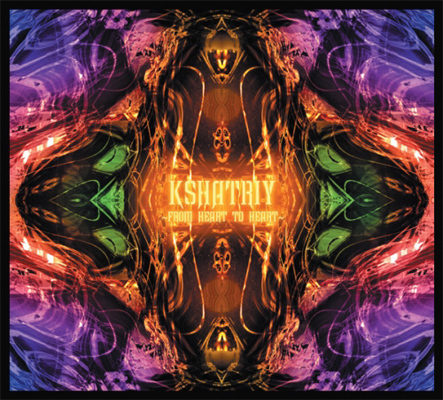 Looking great and sounding better, Kshatriy’s third CD album is a wonderful gift, and since I have the pleasure to own the previous album as well, I can draw a line between the music in these two releases. I can see, well, hear, the direction and length of this imaginary line between the two creations, and then, when I take courage and continue this straight line in order to see where else it will reach, I think I can see some wonderful things.